Halo Radar employs advanced signal processing for digital azimuth and range sidelobe reduction, enhancing discrimination of small targets such as channel markers from larger adjacent targets such as ships and bridges. In addition, Directional Sea Clutter Rejection dynamically changes gain in the sweep to allow smaller targets to be seen in the leeward. Coming soon via free NSS/NSO evo2 software update, Sector Blanking reduces on-screen clutter by eliminating unwanted reflections in up to four user-defined zones. 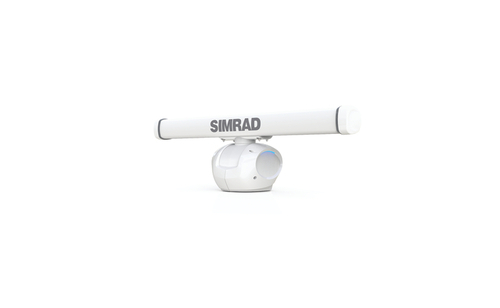 Simrad Halo Pulse Compression Radar connects to any Simrad NSS evo2 or NSO evo2 multifunction display system via Ethernet, with a bulkhead-mounted interface box below deck. Antenna installation is simple and elegant, with the same thin cable and small-diameter connectors as our 3G/4G Broadband radars. *Halo Pulse Compression Radar’s blue 4 level static accent pedestal lighting may not be approved for use in your boating location. Please check your local boating regulations before turning the blue accent lights ON. **MARPA functionality will not be available on Halo at initial release and will be provided via a software update in Q3 2015.